We don't know the particulars of this fight, which went down Monday night during the Chargers' win in Oakland. 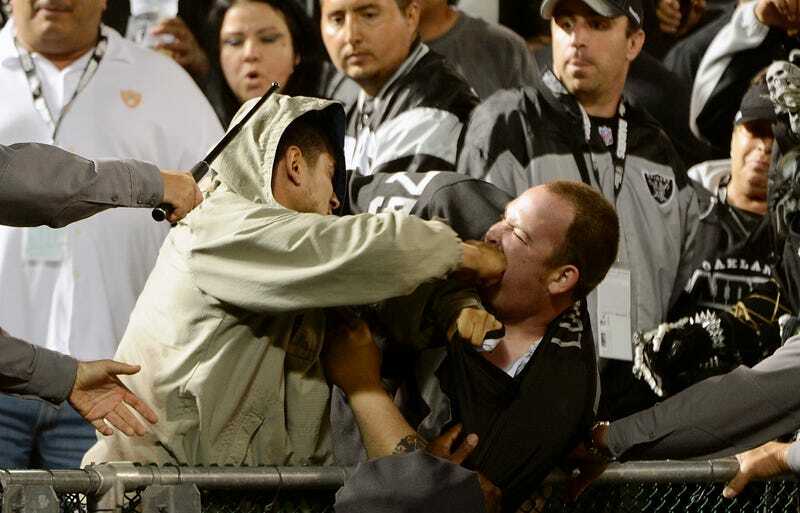 We know, at least, the guy on the right is a Raiders fan, as is the crying woman in photos four and five who attempted to beat security officers with their own handcuffs. We also know Raiders fans were more likely than any other fan base to threaten bodily harm to a writer who wrote not-so-nice things about their team. We know ESPN might have gotten better ratings than they did if they had showed this, instead of Berman. Update: We've now got video of the fight. It's the sixth slide, and it's brutal. Thanks to James Heuser for this video. Jesus.